Yesterday was the second fast of the month and so far I’ve been praying at home. Partly because my local mosque didn’t have a women’s section when I was growing up and partly because I’m not very good with crowds and heat, it’s always just felt more familiar and comfortable to pray at home. And so although there are facilities at the local mosque, the past two nights I’ve waved goodbye to my husband and family as they leave for tarawih (nightly Ramadan prayers), before praying on my own while they are away. But it’s winter in South Africa so heat isn’t an issue, and I was up early and ready to go, so when everyone headed to the masjid for Fajr (the dawn prayer), I jumped in the car. Including myself, my mother in law and another woman there were three of us in the female section of the masjid at Fajr, and it was a beautiful, beautiful experience. The imam recited Surah Yaseen, my favourite chapter from the Qur’an, and it felt so comfortable to be starting the day praying and hearing a beloved and familiar Surah. It made me want to be more familiar with the Qur’an as a whole and to read and listen to it more often so that more chapters and verses become beloved friends, and to make dua this Ramadan that this takes place. My mind was on duas because along with the heart softening experience of beautiful recitation, being in the mosque was a tangible, physical reminder that Ramadan is a time of supplication. It is a time of raising your expectations and knowing and trusting and believing God is Capable of all things. Our local masjid in Joburg is the Houghton West Street Masjid, and last year in Ramadan, before I had ever met my husband, I discovered the masjid when a teacher in Toronto tweeted a link to a recitation of the 99 Names from the Houghton Masjid Soundcloud page. A couple of weeks later the same teacher posted their recitation of Surah Rahman (another chapter of the Qu’ran) and through Ramadan and afterwards as well, the same recitation of Surah Rahman, the 99 Names, and prayers on the Prophet, peace and blessings be upon him posted on their Soundcloud page became things I would turn to time and time again for solace and comfort and reflection. Many months later when I met my husband (a story for another time!) and learnt he is from South Africa, I admitted that I didn’t know very much about the country, but there was a masjid that I loved from afar. There are many, many, many masjids in South Africa, and so I didn’t think this particular one would be familiar to him, but to my great surprise, he shared that in fact, that very same masjid was his neighbourhood mosque, and that he loved their recitation of Surah Rahman too. A few months later, we were married in that very same masjid, and though wedding events and receptions can seem a bit of a blur, our nikkah (wedding ceremony) is very clear. Each time we drive past, or the few times I’ve been to the masjid to pray since then, our wedding day comes to mind, and yesterday’s Fajr prayer was no different. It brought forth memories of arriving at the masjid with my family beforehand, of navigating my long dress and train up the masjid stairs in heels (a new experience) to the female section upstairs, sitting as close as possible to the partition to see down into the mens section and hear the beautiful words and reflections of the ceremony, hugging friends and family and new faces afterwards, praying Dhuhr (the midday prayer) and praying and sitting on layers upon layers of material, making my way down the steps carefully after others left, and praying supplications in the moments before seeing my husband for the first time. Every time we visit the masjid, the anticipation and joy and gratitude of that day comes to life. So much of how we met and married and the details of our story astonishes me, but in particular the connection between us and the masjid makes me stop and reflect every time I see it. When I discovered the Houghton Masjid I never thought about or imagined living in a different country, but as the Qur’an says, God truly is the Best of Planners; He does not ignore any of your prayers and answers your supplications in the best of ways and the best of times. The masjid is a physical reminder of that lesson, and I’m so so grateful for its presence. In the evening, emboldened by my morning masjid experience, I joined the tarawih group and we prayed at the Newclare masjid, and the tarawih was led (though there were multiple readers) by the same person who conducted and spoke at our nikkah. What was special and different about the experience was that once Isha prayer was done, the imam started tarawih by speaking a bit about general themes of what was to be recited, and every few cycles of the prayer, would stop and give tafsir on the verses that were about to be recited. In between the units of prayer there were prayers sent on the Prophet, and remembrance that reminded me of the gadat style dhikr we had at our mendhi function. The reflection that stood out the most for me was the reminders about the beauty and benefit of charity, and that charity is given not of things you dislike, but of that which is most beloved to you. After 10 rakahs (units of prayer) I felt nauseous and my legs felt like they were about to give out (note to self, work on getting stronger) and so despite seeing 60+ year olds in the prayer lines who still looked fresh and excited about prayer, before the next unit of cycle started up again, I excused myself and sat at the back to listen to the recitation. It was beautiful to hear the Qur’an and to see so many people move in unison in remembrance and worship of the Divine. The prayer ended with verses 190-194 of the Qur’an from Surah Al Imraan (the Family of Imran), which are my favourite/among my favourite verses of the Qur’an, and are verses that remind one that the world is a world of meaning, and are a dua for forgiveness and a good ending. Those verses always make me want to strive to do good, to grow and learn and not be complacent, and I’m praying this Ramadan I am able to figure out what that looks like in this new place, and that I am able to be more courageous, more capable, and just stronger overall. When we exited the mosque I still felt a bit nauseous and desperately wanted a Stoneys (a SA drink that is the most amazing ginger drink ever) to help me feel better, but thought that maybe I could think my way into the feelings going away. Which was silly and wrong, but when we got home relief came in the form of wonderful mandarin and lime travel sweets with ginger that we got during our drive back from Durban earlier this week. My first roadtrip of all time brought the discovery that I actually don’t do so well in the car, and I think the rest of the container will be useful (though God willing, not needed too often) during the rest of Ramadan. Ameen to your beautiful duas! JazakAllah khayr. A beautiful post. Thank’s for sharing. JazakAllah khayr for your feedback Zaid! 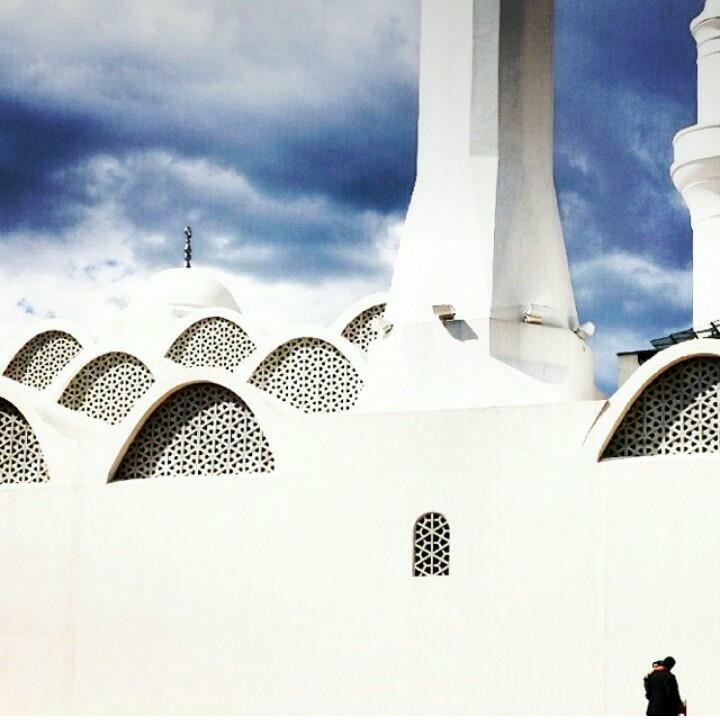 Alhamdullilah for beautiful masjids. Shaguftah your post gave me goosebumps – how incredible are these conincidences and hold true that what was written for us is written by the Greatest of Writers. Your story resonates on so many levels and may Allah always keep this love in your heart for the masjid and bless your every prayer and your marriage – how wonderful that you share this and remember your nikah so vividly. JazakAllah khayr for posting Lubna and for your beautiful duas and thoughts. Your comment brought tears to my eyes. Please do keep us in your prayers!